I always think of my friend, Pearl, when I'm in the kitchen trying to cook. When I lived with her in Nashville she had to teach me how to cut an onion and she still busts my chops about it (lovingly). I remember asking her how to season something and she looked at me funny and said "really? you always struck me as the kind of girl that knows how to do everything?" She must have known what that would do to me because from that day on, IT WAS ON. I was going to learn my way around the kitchen even if it took years of bad food. I still always send her pictures of the things I make and call her asking for help. When Pearl doesn't answer, I call mr. brother in law. 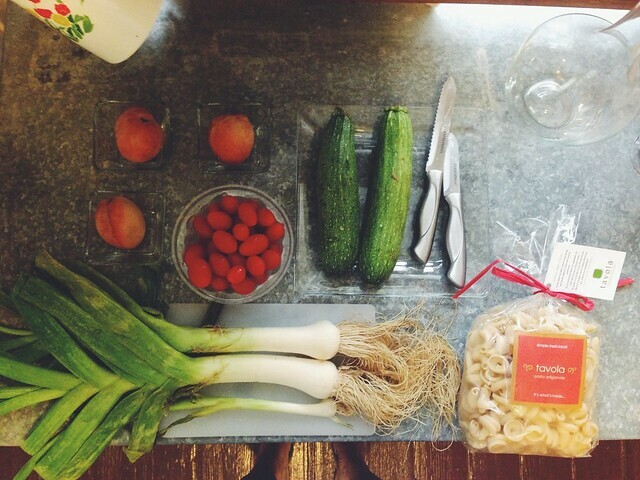 He teaches me things like how to 'Julienne my zucchini'. What? Sometimes, Cheryl will bring something she had too much of at her house and then I get the puzzle of trying to figure out what to do with it. Needless to say, I'm hooked. Thanks to everyone who has contributed to this slow painful growth. I usually like simple when I'm cooking. Nothing fancy. Every now and then I'll have a wow moment. Working my way up, I guess... 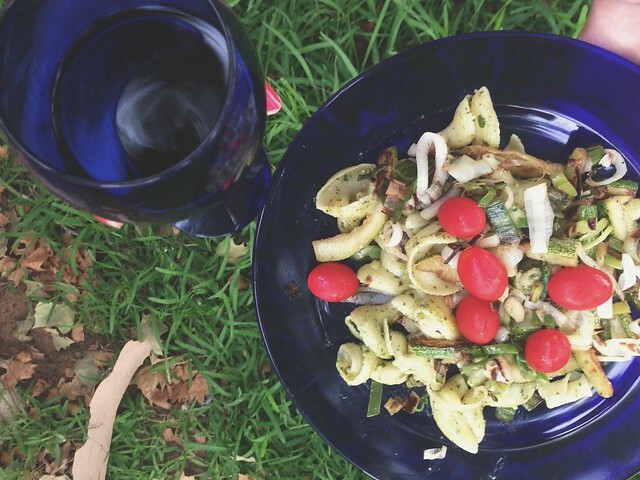 This fiesta pasta was just an experiment of throwing together what I had. It can be served hot or cold. //Fiesta Pasta ...Why? Because it's a party in yo mouth. Tavola Pasta, Cherubs, Pesto, Zucchini, Leeks, hope and maybe luck (I'm no cook). /Cut leeks in rings like you would an onion. I used 80% of the leek. Then I read you should only use the white part... I don't know about this. The whole thing tasted good to me. /Using olive oil, sauté leeks and Zucchini. Season as you wish. 90% of this meal came from Farmhouse Delivery.